Perfect for ingredient storage and a wide range of other food prep tasks, this 1/3 size 6" deep clear polycarbonate food pan offers a valuable addition to your kitchen. Designed to last even in the toughest commercial kitchens, this food pan is made with shatter-resistant polycarbonate material that resists scratches, dents, and clouding up for long-lasting use. It also naturally resists food acids and oils to maintain crystal clarity, making it easy to clean and maintain. Plus, its clear design enables you to easily see its contents, allowing you to easily store and identify your foods during prep. Whether using it to hold fresh fruits or vegetables, bulk sides, or meats, you can rest assured that it will withstand the abuse of daily use. These 1/3 size clear polycarbonate food pans are made with a great and durable plastic material. Love that they are clear so that you can see the contents inside. Great pan for our pizza prep station. It’s sturdy and commercial dishwasher safe. Easy to use and store. Purchase the lids separately. Doesn’t stain either, yay! 1/3 size plastic pans hold slightly less than their metal counterparts. Still a good value and economical replacement for old cracked pans to keep the health inspector happy. We purchased quite a few of these 1/3 pans from Websteraunt store and are very happy with the quality and durability of them. Even after many uses and washings they are still clear and not brittle. You can use these pans to store a variety of different items. We have had ours for years and they hold us so well to washes. Good deal. Buy these regularly because they all eventually crack. these are a reasonable price and the quality is on par with all of the others. These are really nice food pans, We liked it so much that we purchased a lot of different sizes for other things. I like how they are clear so you can see whats inside. They are made strong so they don't break easy if you drop them a few times. These are very easy to clean also. Great Product! These containers and lids are high quality and affordable for my business. They wash up well every time and I know I will have them for a long time. Good size for holding vegetables as you prepare a huge stew for a big family. Durable container without anywhere for dirt to hide, easy to clean. Pretty standard lid. After about a year I had to start replacing some of these as frequent use leads to cracks and scratches. Still a decent container. Clear or translucent is the way to go. The material on this polycarbonate third pan feels sturdy and light. The material doesn't flex and is really clear so that you can see whatever is stored inside with ease. I love these pans for organizing the fridge and pantry. You can see everything at a glance. They stack together nicely and are made of quality materials. The 1/3 size clear polycarbonate food pan can be easily seen thru with its stain resistant material. It also can withstand freezing and very hot temperatures. These polycarbonate food pans are a must in any restaurant. We use them on our prep table and our salad bar. Very durable and easy to clean. I use these containers in the walk-in pantry. They look great, first of all. They don't look cheap and flimsy. As they are tall, they hold items of varying sizes. Perfect for storing. You will be amazed to see how much of your goods this 1/3 pan can hold, the 6" deep helps to keep more for longer time in a salad refrigerator. This pans are so durable because My coworkers abuse them so much and they don’t break nor crack. Love them. Will buy again without a doubt. This guy gets used all the time. I am currently ordering more of these. They fit like a perfect puzzle on top of the full size with lids for stacking. Makes salad night and any other do it yourself bar dinner night (tacos, potatoes, sundae, you name it) easier. Your prep serving and clean up are all don't in one container and leftovers are a breeze due to high visibility. These 1/3 size food pans are great for all sorts of things. This is really deep and can store a lot of food without taking up much room. Very sturdy, quality polycarbonate food pan. It can gather a lot of food and chopped items. Its easy to clean and helps us in the kitchen often. We bought these containers for our deli. We use them to hold lettuce, tomatoes, green pepper and a lot of vegetables very helpful for space. We got these in various sizes. They are durable yet lightweight. The pans are easy to clean and cheap enough you can buy an extra set to have everything changed over every night. Apparently this product can only be giving a high review. Third times a charm. Good strong container, just make sure it's not shipped without plastic & sharp items placed inside. Also when you get a replacement, don't be bothered by a crack on the side. Great numbers on the outside. These are a great way to serve soup from a steam table. After awhile they get worn down from the heat and steam, but they last for a good long while. love these pans because they make my life so much easier with stocking up the food in the fridge, cooler, and freezer. they are very durable too. I use these for everything. Third size pans are great for steam tables/double boiler style steam tables. Just enough food heated without drying out any extra. These are excellent pans, we use them for our prepped foods and sauces. Only complaint is that they don't have a very high heat resistance and tend to warp. Great food pan. Well constructed and very durable. We use these in our prep table for a number of different items and products. Dishwasher safe!! We got these to go in our flip top refrigerator and they do their job well. However we ended up switching to the stainless steel because the plastic does not hold up well to a high use environment. I am still giving five stars because I feel if used as storage rather than service items it may have lasted longer. Purchased this to store extra ice in my freezer to be used when having lots of guests. It has held up well, no problems with cracking. With the lid, the ice stays fresh for weeks. We recently purchased the 6" deed 1/3 clear polycarbonate food pans to add to our current pans. They are very durable. Price is good as well. This is a standard six inch deep plastic pan. We use it for storing many of our food items. We like how durable and easy to clean they are. great simply containers. love that its transparent and we can see the items inside without label. easy to store and stacks great. will order again and all the other size options. A great price for a excellent product. Used this brand for a long time and zero issues. No cracking or discoloration with many washes through dish. Nice weight pan that works really well in our prep line. Seems to be holding up pretty well after several months of use. No noticeable cracks and the corners are still in good shape. The 6" deep pans are what we use for some of our faster moving products. They hold a good amount of food and are easy to clean. Nice sturdy bin for the money. They don't discolor no matter what you put in them. Hard to break, and my staff has tried a lot. Lids seal nicely on these. Highly recommended product. Great quality. Looks nice. Doesn't crack. Durable. Good for many different items. We use these daily and will be reordering more soon. Perfect for storing and stacking prepped items or items on the line. Very durable and easy to clean. Reusable and really last a long time. A restaurant can never have enough third pans! These are about half the price of the name brand versions, and they stand up just as well. Perfect for storing food or even using it to oraganize your shelves with small things that may drop through the metro shelving units. Perfect pans. Great clear food pan! These are just as nice as Cambro and wear nicely. Size is a little different than Cambro but it should fit anything you have. These 3rd pans are great for a variety of uses. I like the clear type so I can see what it is right away, and it's wide enough to fit an ice wand in which I use to cool small batches of soup with. sometimes you need to be able to see the product you have in a container so using a clear food pan like this is perfect. they're very sturdy and can sit under a heat lamp for hours without altering the structure of the pan. This is a great pan option for items that could be damaged by contact with a cold metal pan (greens, spinach, etc.) They are also nearly indestructible. These clear polycarbonate products are great. They are very sturdy. We have dropped them numerous times and never crack. I would highly recommend this product. They our very durable and look really nice for a catering event to keep salad or fruit stay fresh . I use them for vegetables and fruit to store in my fridge with the lids. Awesome buy on these poly food pans! Purchased from Webstaurant Store at a fraction of the cost from my national food provider. Great deals here! By buying a couple of these we can swap our our line and microwave product to temp. Wish they had a higher temp they can with hold. These ae quality food pans that will hold up after many uses and washes. They stack nicely for storage. The plastic material is very clear when new. We had quite a few of these cracked in our salad and expo side cooler and needed to replace. Packaged well, good price on volume, and look great. Durable and easy to clean variety of sizes in these pants so with the price you're allowed to have so many different sizes that we can switch them out easily . Our sandwich prep station only holds 1/3 or 1/6 food pans. The 1/3 size deep pan allow us to hold more food and switch them out more frequently. They're easy to clean and very affordable. Container can store just about any cooking ingredients anything from wet to dry products, I use it in the kitchen along with baking needs to utensils. I like this brand of 1/3 pan because it does not melt or fog as quickly as some other brands do. You know the kind of torment you put these pans through- so stock up and keep your kitchen tight! These polycarbonate food pans are great for all restaurants. They store cool and warm food items and they don't scorch sides like the metal pans will do if they are on the warmer most of the day. Price is always right from Webstaurantstore.com so it's a win win. We typically use these as lids on our alfredo sauce, marinara sauce, cheese sauce, and also as lids to store backups of some pizza ingredients. These 1/3 pans are so useful and practically indestructible. We use them to hold greens, sauces, condiments. Bought 6 and that wasn't nearly enough. Need to purchase more already. 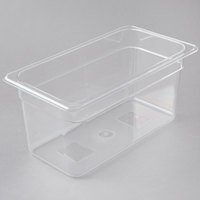 This would be the same as the 1/6 size polycarbonate food pan, the only difference is it's bigger and it would be for items that wouldn't fit in the smaller container. Great size containers for food wells when you only need a little of an item in the wells. Easy to clean and optional tops are available to cover. These are being used in a commercial restaurant and are holding up nicely. They came true to size and the 6" deep provides enough volume to get through a busy shift. They seem durable and like they will hold up for a while. 1/3 Size Clear Polycarbonate Food Pan - 6" Deep - sturdy. easily cleans. lids fit well. Great product - will reorder same if ever needed. We use these to hold our sauces in the cold well during service and they perform admirably. It'd be nice to have shallower ones too. Really useful for storing produce. Very durable and solid construction. It's transparency is what makes all the difference. It is really easy to see how much product is left. works great in refrigerator, freezer, or regular shelf storage. helps keeps odds and end organized when not being used to store food product. strong and sturdy and clear helps keep items distinguishable just by looking. Excellent 6-inch deep polycarbonate food pan. The polycarbonate food pan is shattered resist They are easy to clean and dishwasher safe. These pans can withstand a large range of temps. They don't scratch or cloud up. I bought several of these hoping that they would fit well in my food warmer and would be long lasting. So far these containers fit the bill perfectly. They fit in the warmer and can hold a lot of food. Temperature does not seem to bother the dishes and they wash easily. The 1/3 size 6" Deep Clear Polycarbonate Food Pan is a wonderful product. It allows you to see the product inside and is very easy to clean. They also fit perfectly in the bain marie. These are perfect storage pans for our restaurant needs. They are very clear and seem to be durable so far. This size is just right, too. I like how easy they are to clean. Got this pan last week. Usually I will buy Cambro or Rubbermaid. I was happy with the quality and construction of this item. I look forward to it lasting as long as the name brands for less money. we use these food pans for basically everything and we use them everyday. they are useful for fruits, extra storage, or just for emergencies. they are durable and reliable. Great buy for the price. Very durable glad I made this purchase works great in our sandwhich prep table. I actually different sizes. Highly recommend all!!! Nice pan. We like it a lot. Bought a lot of these and expect them to hold up really well. Definitely this over a cambrio name brand. We use a ton of these 1/3 size pans in our restaurant. they stack nicely both in storage and in use (with lids). They're nice and clear and very reasonably priced. This clear food pan was an addition to the prep station we had ordered and has helped us in prepping many sandwiches. The pan is easy to clean! We bought this size container for bread dough. They are stackable with the lids which helps save counter space in the kitchen. They are very durable and stack inside each other when not in use. Very good product. A perfect fit for our pizza prep table! So convenient during a rush to simple swap out containers and know that every container is properly cleaned and sanitized. Definitely worth having a small stock pile! Best price we could find anywhere for these pans including the used stores. Very sturdy with no cracks or warping after a year of steady use. Great! Perfect size for any prep table. Easy to store, use to wash, Holds enough product. Great for the price. would highly recommend this product to anyone with a prep table. A great item that we are suing to store food both on the line and with in the walk in cooler. We love these very much. Before discovering this website I would go to my local restaurant store and drop a lot of money on these food pans. Waiting 2-3 days for shipping is definitely worth it, these pans were at least 60 percent cheaper than the store. Super durable and easy to clean in a dishwasher. As a side not, you must purchase these with the lid, its pointless if you don't. Love these containers easy to store and organize food! Clear and easy viewing as well as clean. I definitely recommend this product even for residential use! These pans are perfect for the Avantco Pizza Prep table. The quality is great and they clean up beautifully. Purchased with the lids they are perfect for keeping toppings! This is a great 1/3 pan. I have several of them and they do great work for both cold and mid warm storage. Very versatile, and well worth twice what I paid for them. I found this site by accident. It was great price so I ordered pizza tray wasn,t good but usable all aether item like pizza bag containers dough hook in good quality now I am very happy to find the WEBstaurant.